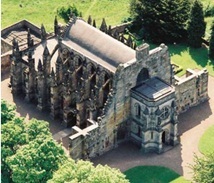 Following a successful visit back in 2003, the Conclave decided that it was time to revisit the famous Rosslyn Chapel, near Edinburgh, and a small group of members travelled north for the Bank Holiday weekend at the end of May. 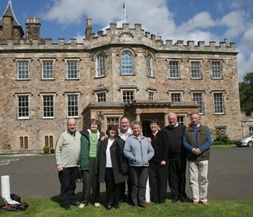 Having met up just over the border for a pub lunch, we travelled north to our accommodation at Newbattle Abbey College, near Dalkeith. This is Scotland’s only adult education residential college, and is also open for conferences and small groups of visitors. It is set in 125 acres of beautiful parkland and the historic 16th century building and peaceful surroundings made it an excellent base for our weekend. Indeed, on our way to eat in the crypt refectory on Friday we passed an oak chest said to have come from the Spanish Armada, and the chapel contains a stone font said to have been used to baptise Mary Queen of Scots. 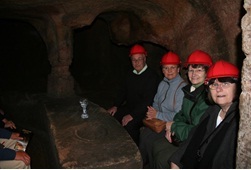 After a pleasant evening socialising and visiting the cold and windy city centre, on Saturday we took our first guided tour of nearby Gilmerton Cove. This is a series of hand carved passageways and chambers about ten feet below street level. The caves are said to be several hundred years old, but fell into disrepair and were only re-discovered a dozen years ago. Now restored, the Cove is open to visiting groups, who are full of admiration for the works. There are many inscriptions carved into the rocks, including a number of masonic symbols, but despite tales that the site may have been used by the Knights Templar and even housed the Holy Grail at some time, archaeological surveys have been unable to find the truth of the site’s use. It really is one of Scotland’s hidden gems, and if you want further information please visit the website at www.gilmertoncove.org.uk, and don’t miss the short video clip! From Gilmerton we made a short detour to visit one of Scotland’s best-preserved medieval sites – Craigmillar Castle. It was here that Mary, Queen of Scots convalesced after the birth of her son, James I of England, in 1566.